The room turned alarmingly quiet as the court and audience listened to the testimony of Carina Rapaccini. It was the first time in over 30 years that she had testified publicly about the fateful night of her father's disappearance. Though she had been only 9 years old at the time, the memory of the event appeared to be so fresh in her bloodshot eyes, it was as though it had occurred only moments before. Tearfully she proclaimed, "I don't understand everything that happened. Thirty-three years have passed and still I know nothing. It was a silence so big and still, it goes on. I have no one in my family to speak of this with. I am alone, but I fight for this case, for all of these cases, for the memory of what happened." Testimonies, such as Rapaccini's, commenced the third week of September and have signified for those injured during the Argentine military junta that their excruciating battle against impunity may finally be coming to an end. For the first time in nearly 30 years, testimonies, to be followed by criminal prosecutions, have been reinitiated against those responsible for the state-sponsored terrorism that occurred between 1976 and 1983. Beside the victims of this dark history is the human rights organization, La Asamblea Permanente por los Derechos Humanos La Plata (APDH), the Assembly for Human Rights. Lawyers from this organization have been working with and representing victims and their families since the midst of the military junta. They have also been acting as the strong hand against the government to end the impunity that has wreaked havoc on the Argentine judicial system. APDH La Plata is an organization consisting of lawyers and volunteers from an array of political and educational backgrounds. These individuals have, without rest, been fighting for the rights of those kidnapped, tortured and humiliated during the military junta, and have continually expanded their goals to meet the social and justice challenges that exist in Argentina. In an interview with one of APDH La Plata's human rights lawyers, Silvina Negrete expressed her sentiments on the importance of the trials and prosecutions from a political context. Negrete explained, "What has happened here is that there is finally an opportunity to hold people accountable for their actions. Moving forward with these cases is not about bringing shame, or even being able to condemn these people, the cases are important because they represent that we do in fact have a constitutional democracy and that the government of Argentina recognizes that what occurred was state-sponsored terrorism and genocide." Negrete and many others involved at APDH La Plata have expressed their optimism that the cases represent not only an end to impunity, but also a means for victims and their families to have some form of closure and reparations for what occurred. Each week the court and its audience have continued to hear an array of bone-chilling testimonies from victims and their family members. Included in these was the testimony of "Chicha" Mariani, one of the founders of La Asociacion de las Abuelas de Plaza de Mayo (Association of the Grandmothers of Plaza de Mayo), an organization that has worked very closely with APDH La Plata. In her first full testimony, which included supporting architectural evidence, Maria Isabel "Chicha" Chorobik de Mariani described in detail what transpired on the fateful day of November 24, 1976. "Chicha" explained the raid of her son Daniel's home by the Brigada de Investigaciones, which resulted in not only the murder of her daughter-in-law Diana Esmeralda Teruggi, but also the kidnapping of her three-month-old granddaughter Clara Anahi. Other testimonies have shed light on the manner in which victims were kidnapped from their homes. Account after account describe armed personnel dressed as civilians, breaking into homes and forcefully taking individuals. Once detained, these individuals were handcuffed, blindfolded and thrown onto the floor of the perpetrator's car. From here they were taken to secret detention centers, the majority never knowing the charges being held against them. Hugo Amendola, an ex-detainee from a detention center in La Plata, explained in his testimony that at the time of his detainment "they covered my eyes and yelled a lot.… I kept saying, "I don't understand, I have never been involved in politics, in nothing'"
Although trials and prosecutions did occur immediately following the end of the military junta in 1983, civilians and military involved in the regime were quickly exempted from trial due to Ley de Punto Final, 1986, and Law of Due Obedience, 1987. These pardons not only left an already-scared populace without justice, but also demonstrated that the government was unwilling to hold accountable those responsible for the kidnapping and torture of thousands of Argentines. In 2003, el Congreso de la Nacion declared both of these laws void, thus allowing for the re-opening of cases that involved crimes against humanity. The first of these cases, which involved the former Buenos Aires Provincial Police Officer Second-in-command Miguel Etchecolatz, ended in September 2006. This case laid down jurisprudence by acknowledging that the dictatorship's state terrorism was a form of genocide. Though monumental, the case also demonstrated that insecurity still existed in Argentina, when a witness against Etchecolatz went missing the day of the sentencing. Julio Lopez was a key witness from La Plata, who had played a significant role in the trial and life sentencing of Etchecolatz. 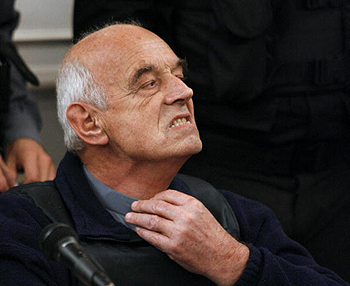 Etxhecolatz was convicted on charges of homicide, illegal deprivation of freedom (kidnapping), and torture in the context of the genocide that occurred in Argentina. On the day the tribunal mandated the sentencing, in September 2006, Lopez mysteriously disappeared. This event left the entire society, particularly in La Plata, shaken and led many to seriously consider the fact that there still may have been authoritarian cells operating in the dark in Argentina. Incidentally, the present testimonies have been reinitiated following the third anniversary of Lopez's disappearance. To date, the first group of prosecutions is set to commence on December 3, 2009. This set of prosecutions will include 15 members of the military junta from "La Unidad Penal N° 9," a secret detention center in La Plata. The charges against these individuals range from counts of homicide and torture to the illegal deprivation of freedom, which occurred between December 13, 1976, and November 1978. While the outcomes of future prosecutions are yet to be known, it is at least certain that the demands of the Argentine people and APDH La Plata are finally being heard. The time has come to put an end to impunity and welcome justice back into Argentina society. Alexandria Prain is an intern working for La Asamblea Permanente por los Derechos Humanos La Plata in Argentina, through the Foundation for Sustainable Development.